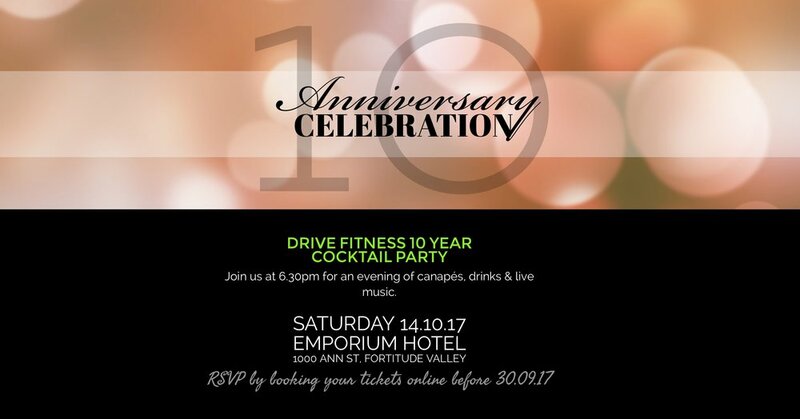 We would love your company on Saturday 14 October to celebrate 10 years of Drive Fitness in style. Join us for a cocktail party at the Emporium Hotel at 6:30pm for an evening of canapés, drinks & live music. Complimentary drinks, canapés & fork dishes between 6:30-9:30pm, red carpet entry with photographer between 6:30-8pm, live music, juke box and dancing (optional) until 11pm. We're looking forward to it already and we hope you'll be there to share it with us. RSVP's have now closed. Please contact David on 0402 385 127 or email dave@drivefitness.com.au to find out about availability. Click here to purchase a ticket for a parter or a friend who's not a Drive Fitness client - maximum of one +1 ticket available for each attending Drive Fitness client.